All children are human beings born with rights, which include the right to the services, care and support that will ensure their safety, health, growth and development. Children are the centre of Early Childhood Development. Commitment (ECD) to providing effective services and programmes for them stems, first and foremost, from a dedication to their well-being. In the message of Ubuntu resides the notion of a shared humanity and responsibility to one another that crosses race, creed, gender, religion and age. Within the spirit of any child, is my child. Children are precious and valuable beings, to their immediate family and community and to society as a whole, not as the future generation but, as the present, here with us today. So, at the heart of ECD is the notion of children as important, with a place in the world. Ilifa has taken the term, being a somebody, a term which is commonly used in discourse in South Africa, to signify that all children are “somebodies”, deserving of care, support and opportunity in life to realise their potential, as fundamental to the vision of our work. From the moment children are conceived, their development begins. They should be able to grow, uncompromised by foetal alcohol syndrome or stunting because they are malnourished. From birth, they should be held, comforted, read to and sung to while enjoying the touch of genuine care … because they are our children, somebodies, here and now! Investment in ECD is critical to individual growth and wellbeing and more generally to social and economic development – achievement at school and in life generally begins in the womb, with good early childhood development. The implement and test a comprehensive package of ECD for a significant proportion of children within defined geographical areas. Support for the development of appropriate management for scale-up. Support to the development of needed human resources for early childhood education. The generation of evidence to support a case to advocate for expanded access to public funding for ECD for all children who need it. Strategies to increase public demand for quality ECD by putting in place a programme of support to parents and carers that begins with pregnant mothers. The first focus of the campaign is to promote ECD and its importance to the well-being and development of children. It places children at the centre of ECD endeavours, supported by their carers and communities. It will offer insight into ECD as integral to the wellbeing of the child and therefore, society and to a positive outlook for the future. The idea of a comprehensive package of integrated services with a particular emphasis on provision to poverty affected marginalised children will be promoted. Since Ilifa recognises the state as the primary duty bearer for the provision of ECD services, supported by civil society, one of the primary audiences for this aspect of the communication strategy is the state. The strategy will thus promote knowledge and understanding amongst duty bearers and caregivers in order to facilitate positive behaviour changes that prioritise developmentally appropriate actions for children from conception to 6 years of age. Intervene early – the brain doesn’t develop backwards! 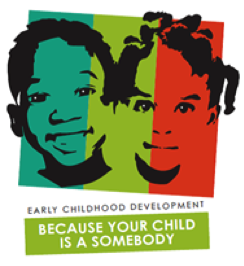 Based on the results of four years of research by two of South Africa’s top academics in the field of Early Childhood Development, Ilifa Labantwana’s “Your Child is a Somebody” campaign will be launched in Johannesburg this Thursday. The research, the Sobambisana Initiative, set out to develop, implement and evaluate models of ECD provision that would increase access to and improve the quality of ECD for children in communities where few, if any, services are available. Ilifa hopes the research results and the campaign will help inform government’s unfolding policies and actions in this domain. Early childhood development was highlighted as a top priority by Minister in the Presidency, Trevor Manuel, when he handed over the revised National Development Plan 2030 to parliament in August. Government’s National Integrated Plan for Early Childhood Development in South Africa, 2005-2010, is currently being revised and deals with children’s health, nutrition, support and stimulation at ECD centres, as well as by primary caregivers in home and community settings. It is a recognised fact that the first 1,000 days, from conception until two years of age, lay the foundation for later development, making investing in early childhood development crucial, firstly for the children of South Africa, but also for the future of the country. Your Child is a Somebody will be launched on Thursday 27 September at The Old Fort, Constitutional Court, Johannesburg. For more information visit www.ilifalabantwana.co.za. Ilifa Labantwana (Children’s Heritage), is a partnership programme of the ELMA Foundation, the UBS Optimus Foundation and the DG Murray Trust. Within the Early Childhood continuum from prenatal to age when a child enters primary school, there are four main age periods (0 -2 or the first 1000 days, 2 – 4, 4 – 6 and 6 – 9), each of which offers differing risks and opportunities. Approaches to ECD need to recognize that interventions are cumulative and synergistic, that the maximum benefit in one age group is derived from experiences in earlier age groups and those interventions in one generation bring benefits to successive generations. A package of services includes access to nutrition support, parent and psycho-social support, cognitive and language stimulation, early literacy and numeracy, access to healthcare, social and protective services.